Digi-Schlock: THE SWIMMER (Grindhouse Releasing Blu-Ray/DVD Combo Pack) – Schlockmania! The Swimmer has been in home video limbo since its 2003 DVD drifted out of print. Plenty of film buffs wondered if it would make it to the high-def realm and, if so, who would do the honors. The Criterion Collection seemed a likely bet. Few people would have guessed that Grindhouse Releasing, known for its high-class treatment of critically disrespected horror and exploitation fare, would end up with this title. However, they picked it up as part of a deal with Sony and have applied their usual high standards of quality. The result is an excellent new blu-ray/DVD combo set that represents a surprising but welcome marriage between the artiest of Hollywood films and the most cultish of genre home video specialists. The bonanza begins with an excellent new high-definition transfer of The Swimmer, presented in both DVD and blu-ray formats. The blu-ray was watched for this review and the transfer looks lovely in this format: a vivid yet natural color palette, plenty of crisp details to the image and a pleasing celluloid texture. The original mono mix is used for the audio and sounds robust, with a clear blend of dialogue and sound effects plus a strong presence for the lush Marvin Hamlisch musical score. On the latter note, there is also a stereo music-only track included: given that the music functions like a character in this film, this provides a viable alternative viewing experience for fans. Grindhouse has also assembled an impressive roster of extras for this set, an impressive achievement when you consider that most of the key creative players on this film have passed on. The centerpiece of the extras is The Story Of The Swimmer, a quintet of interlocking featurettes that can also be played end-to-end. Participants include 1st A.D. Michael Hertzberg, 2nd A.D. Ted Zachary, actress Janet Landgard and Joanna Lancaster (daughter of Burt), who act as the anchors of the piece, with other cast and crew filtered in as the different segments require. The whole shebang runs two and a half hours and gives the viewer an intensive course in this history of this unusual and memorable production. The first part of The Story Of The Swimmer is entitled “Backstroke” and deals primarily with the pre-production phase. 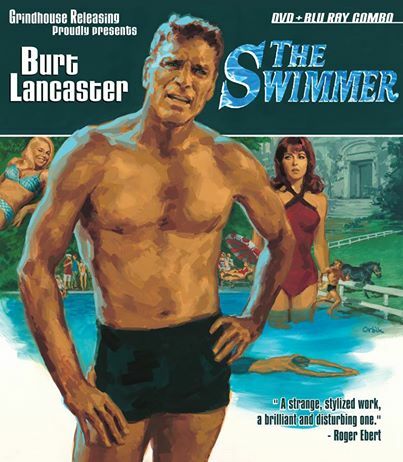 Fans will be interested to hear that Burt Lancaster had zero swimming skills at the outset of the production and undertook extensive instruction with swim coach Bob Horn, who is interviewed at length here. The next segment is entitled ” East River Crawl” and gets into the tense power relationship between Lancaster and Frank Perry while also touching on stories of script revisions and a few fun production stories, including a surprise visit from Paul Newman. The third part of The Story Of The Swimmer is called “Beneath The Surface.” A fun interview with Joan Rivers kicks it off, with her telling the story of how the Perrys created a part especially for her and getting caught between Lancaster and Frank Perry’s dueling interpretations of her scene. From there, it gets into stories of how the Perrys also battled with producer Sam Spiegel and his emissaries over script and production issues. The fourth part is entitled “The Deep” and is perhaps the most interesting of the segments. It deals with the protracted and painful post-production and reshoot process that The Swimmer went through on its way to the finished version. There are tales of how Spiegel interfered in the editing process and how Lancaster brought in his friend Sydney Pollack to shoot new versions of four scenes, including the famous Janice Rule scene. You’ll learn what famous person’s interference led to the removal of the scene with Barbara Loden and an interview with editor Sidney Katz reveals how he was brought in to salvage the film. On a happier note, Marvin Hamlisch chimes in with the story of how a chance encounter with Spiegel led to him writing his first film score for The Swimmer. The finale of The Story Of The Swimmer is “Shallow End.” It closes out the tale of the film’s editing process, which ironically led to a working relationship between Katz and Perry, and allows Hamlisch to go into detail about the why’s and how’s of his excellent soundtrack. All the participants offers their retrospective thoughts on the film and how its defiance of entertainment norms led to it becoming a cult classic. All in all, The Story Of The Swimmer is engaging and, despite its length, fast-paced. Two and a half hours might seem like a long time to spend on one film but this documentary is about more than that: it also tells the story of the changing of the guard from the studio system to the New Hollywood era – and the pain of being ahead of your time. Director/writer/editor Chris Innis does a fine job pacing the documentary and drawing out insights from the participants. The result is something any student of old Hollywood will enjoy watching. There is an additional interview piece in which filmmaker Allison Anders, a fan of The Swimmer, interviews actress Marge Champion after a screening of the film. The Hollywood veteran shares a few memories of the film but her anecdotes about being a child during the Great Depression are the most memorable part. Fans of the film will be interested to see the producers have included a recording of author John Cheever reading his original short story. It provides an interesting comparison to the film, illustrating how Eleanor Perry had to elaborate on and restructure the tale to make it a screenplay. The remainder of the special features are devoted to promotional materials and credits. A trailers area offers a memorable theatrical trailer that sells the thoughtful nature of the film effectively plus an array of television spots that draw on different aspects of the theatrical trailer. There are also a series of image galleries that cover on-set photos, stills, promo art and even a gallery of publicity photos for Janet Landgard. Fans will be interested to see stills of scenes that didn’t make it into the film, including a full gallery devoted to the never-seen sequence with Barbara Loden. The last inclusions are a set of filmographies (look for a surprise trailer on one) and a set of disc credits. However, that’s not all that the set itself includes. The final extra is a liner notes booklet featuring two essays. The first is an appreciation of the film from director Stuart Gordon that compares and contrasts the film with the short story that inspired it and makes an interesting case for it as an allegorical ghost story. The second essay is by Innis who chronicles the film from genesis to cult following. It offers a lot of information that supplements The Story Of The Swimmer, particularly the intriguing biographical details about Eleanor and Frank Perry. Simply put, this set is a stunner. Grindhouse Releasing has proven they can step into Criterion territory with skill and style, delivering a killer transfer and a set of supplements that go deep into the film and the artistic tug-of-war that spawned it. It’s an early contender for 2014’s best-of-year list and proof that Grindhouse has plenty of surprises up its sleeve. To read Schlockmania’s film review of The Swimmer, click here. Addendum 3/31/14: The earlier version of this review neglected to note the additional bonus materials included on the DVD-ROM portion of the DVD in this set. It contains three significant inclusions, all worthy of study for the film’s fans. The first is a copy of the film’s screenplay. To be specific, it is the third revision and dated 2/18/66. It obviously lacks the material from the reshoots, like the scene where Lancaster races the horse, but is otherwise pretty similar to the finished film. That said, close study will allow the reader to notice some different dialogue in certain scenes and a few bits of business that were ultimately removed from the script. The next inclusion is a seven-page essay by Gergely Hubai about Marvin Hamlisch and his musical score for The Swimmer. It tells the tale of how Hamlisch transformed a gig playing piano at a Sam Spiegel party into the opportunity to write his first soundtrack and then discusses his approach to film scoring and how he learned about the trade on the job. A cue-by-cue analysis of the score follows, with the kind of commentary you usually get in the booklet of a good soundtrack reissue. Hubai also provided soundtrack notes on Grindhouse Releasing’s release of The Big Gundown and his work here is of a similarly high caliber. The final inclusion is the juiciest: it’s a set of notes and correspondence written by Eleanor Perry regarding her experiences on the film. The first part is a pitch and a manuscript for an unpublished article entitled “The Shallow End.” It’s subtitled “How The Swimmer Drowned” so that should clue you in to the acidic tone of this production chronicle. The articles is a grand “Hollywood nightmare” tale, packed with the all the broken promises, bait-and-switch tactics and skullduggery you would expect from such a story. Despite her soul-crushing experiences at the hands of Sam Spiegel and a few other industry types, Perry is able to balance her withering view of their deeds with a wonderfully dry sense of humor. The results are a truly engrossing read. The last few pages of the nearly 50-page document are devoted to a few letters penned by Perry to Spiegel. The first is a short, amusing chronicle of production supervisor Roger Lewis’ misdeeds on the set. The second she co-wrote with husband Frank and it offers a six-page response to a ham-handed edit of the film prepared by Lewis and Joseph Manduke. The Perrys’ defend their work elegantly and skewer Spiegel’s mangling of it with a light yet incisive touch. The letter leaves the reader with the impression of how incredibly difficult it was trying to make “New Hollywood”-style work in the dying days of the studio system. In short, these DVD-ROM extras add a whole new layer to the already multi-layered set of extras on this set. Fans of this film will be happy that Grindhouse went the extra mile to include them.